According to my girl, Jess, stars are the new polka dots! 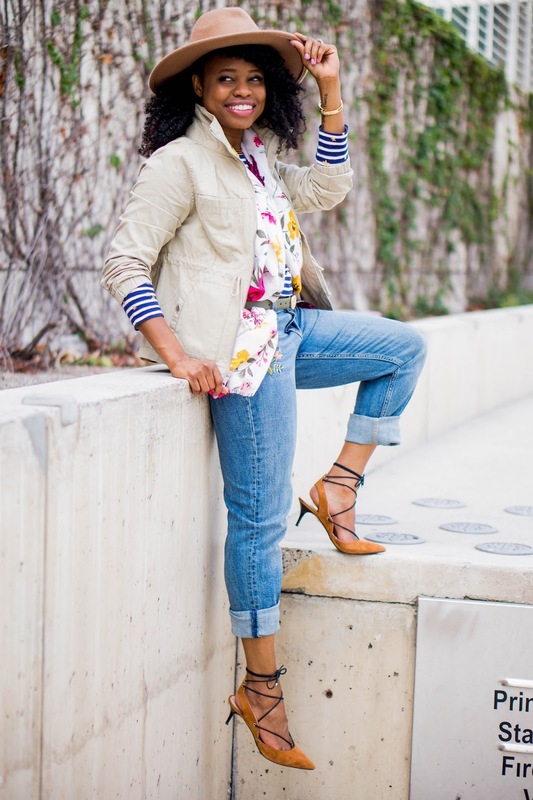 And I'm here for it, especially in this playful prep look with Old Navy. 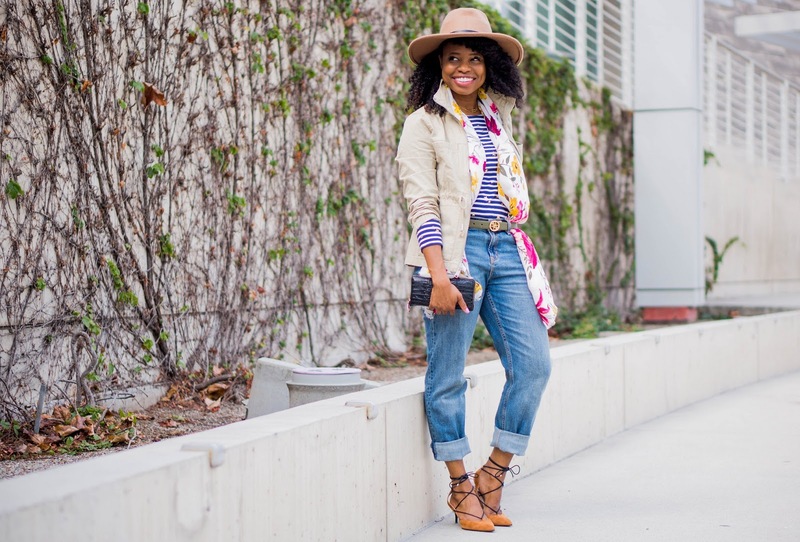 I was going for stripes, mix and match prints and some layering. So this is probably a bit preppier than you're used to seeing on me, but I also think it's a good way to transition a look from summer to fall. 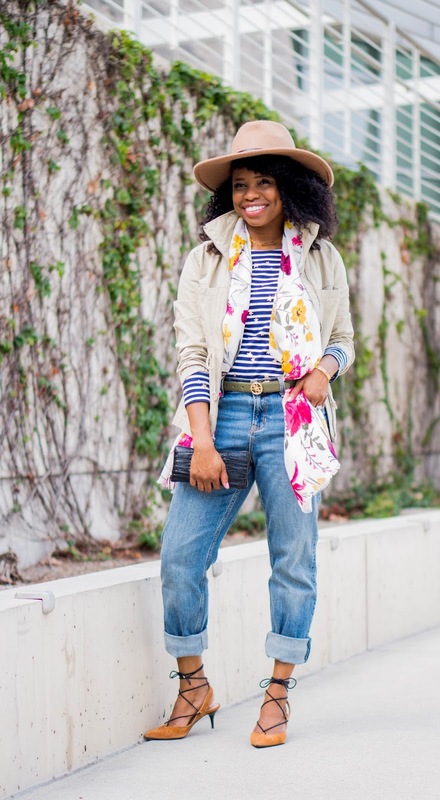 The layering over denim gives this look a classic feel while the printed scarf adds texture. The star studded top is 100% cotton with a soft, medium-weight slub-knit jersey. This makes it pair really well with the embroidered floral patches on the relaxed fit boyfriend jeans. Did I mention these jeans come in plus size as well? And if you're looking for something with a tighter fit but that could also get you geared up for fall, then try the Stevie suede ponte-knit leggings in colors like wine tasting and makes cents. And to complete the look, we're going with layers! 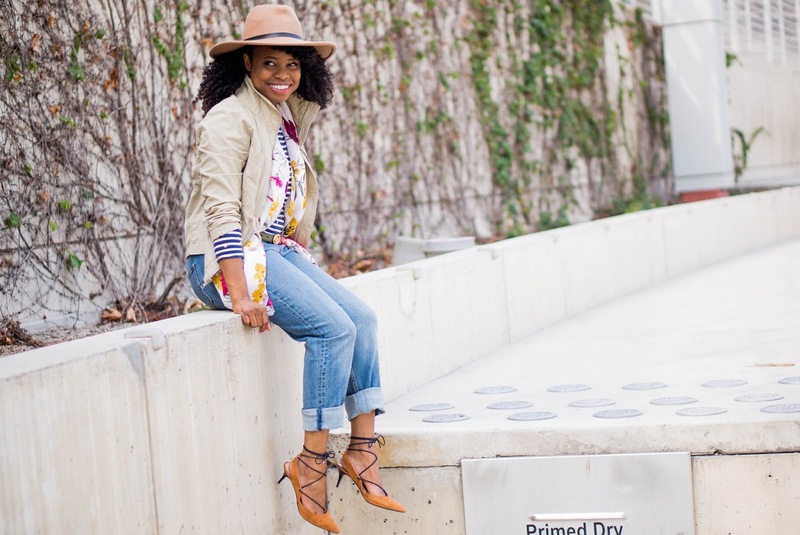 I love a good twill jacket when it comes to fall layering. Since I already own a similar jacket in olive, I went with this one in a winter reeds tone. 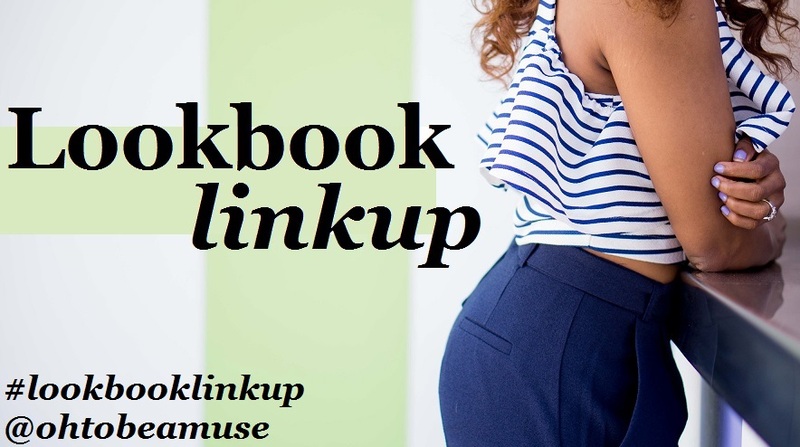 It's the added pretty and practical piece that you need to complete this playful look. If you want to double the embroidered fun, then opt for this version in pine needles. Last, but not least, is the addition of this printed scarf. It comes in a variety of patterns, but I went with the pink and white floral to complement the embroidery on my jeans. So does this playful prep look inspire you for fall? Technically, we still have almost two weeks until the official first day of autumn, but it's never too early to get your transitional game on. 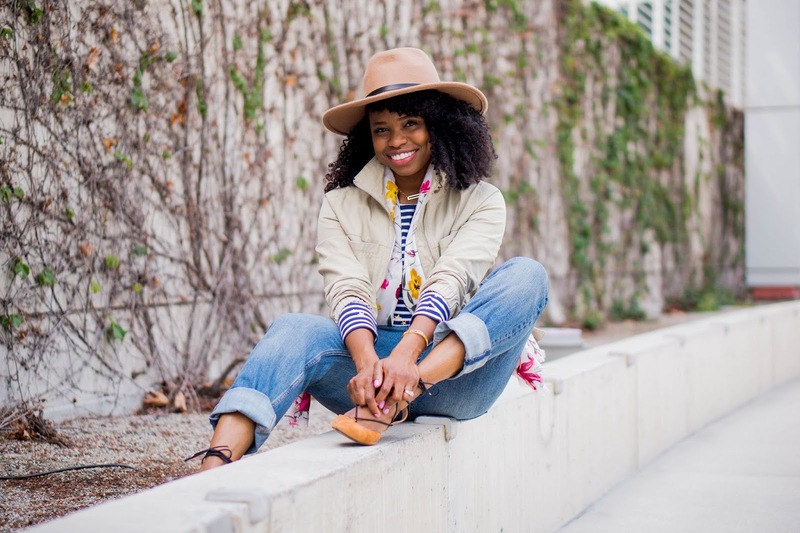 Old Navy is killing it! I love how your tee is a mixture of star prints and stripes. Not going to lie, the stripes won me over! 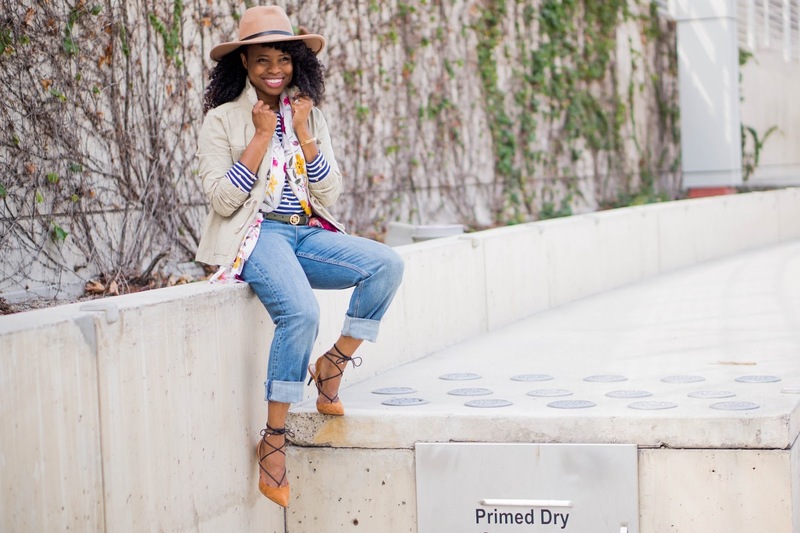 Love how you finished this outfit with those lace up heels! Old Navy sometimes has the best stuff!!! I love the addition of the scarf to this look. Brings it alive!!! Too cute! 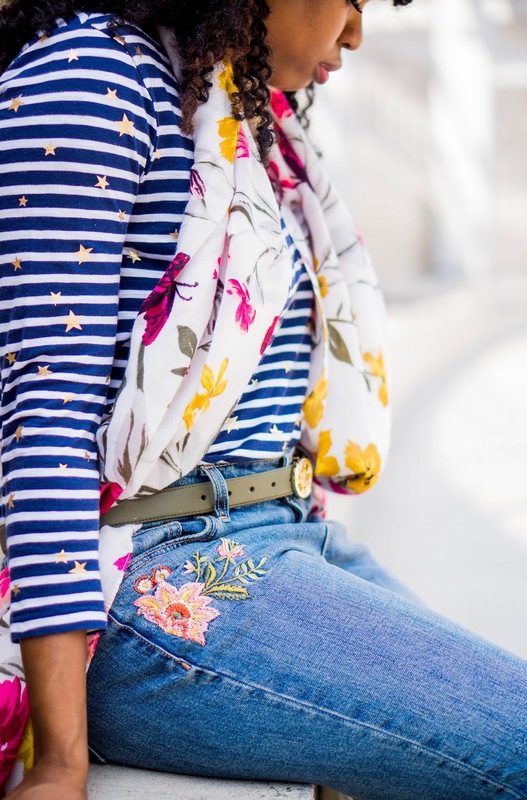 I love how you styled your scarf, the embroidery on the jeans, and the stars on your top! I thought your top was just stripes but then I saw the stars in the close up shot. 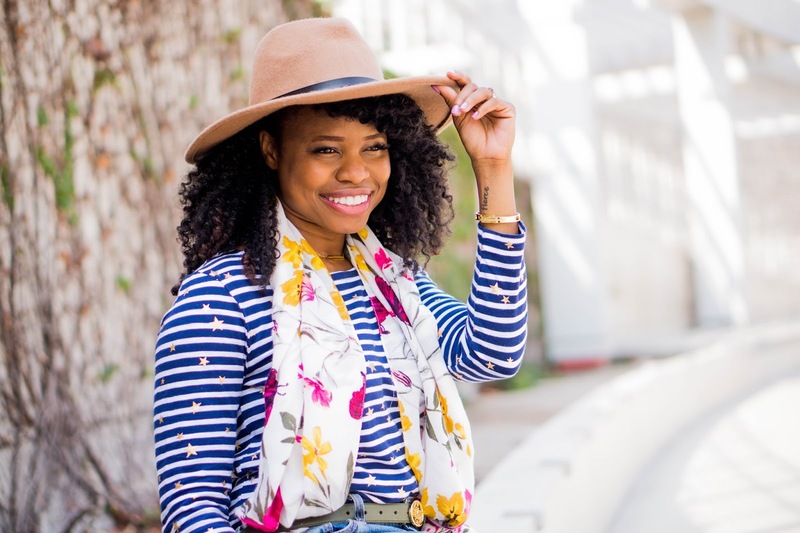 Such a little detail can really add to the impact of an outfit and that scarf is everything! Classy and cute. I love the pictures! Such a cute outfit. Loving the stars and all the fun leyers of this look. 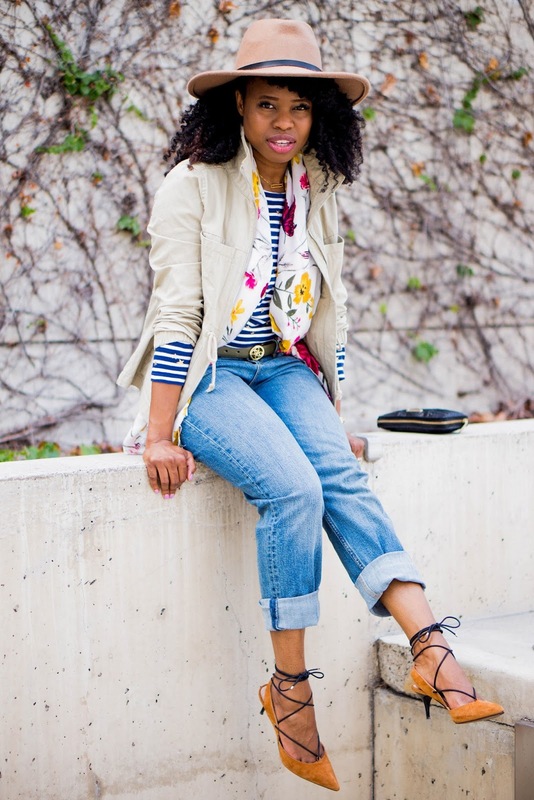 Love your pattern mixing! That scarf is so pretty! Stripes, stars, flowers and that winner smile ! You've got yourself a fab look C! That outfit is so cute. All those different patterns really work well together. Love the shoes!! I love those jeans they are so cute and I think the top is a must have for me. I actually love everything about this look. Oh my goodness can you be more adorable in this outfit?? No! 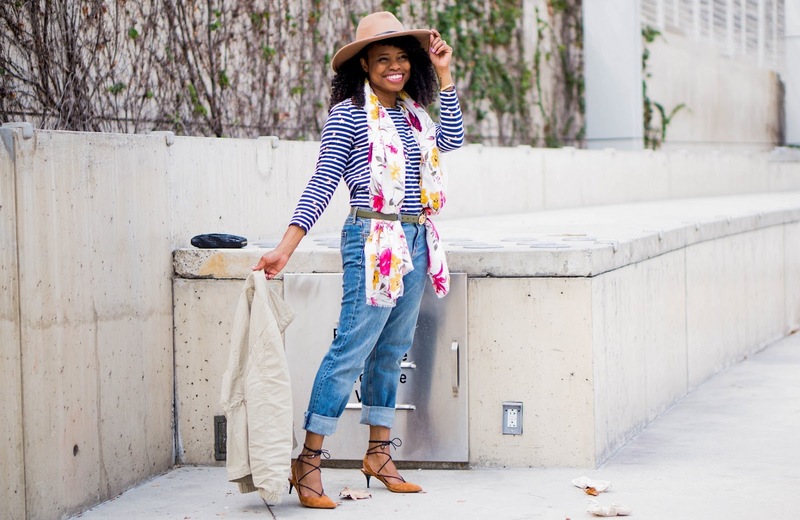 That striped top is so cute, and I love it with the floral scarf! Love your adorable shoes and the jeans. Thank you for sharing, you look stunning!!! 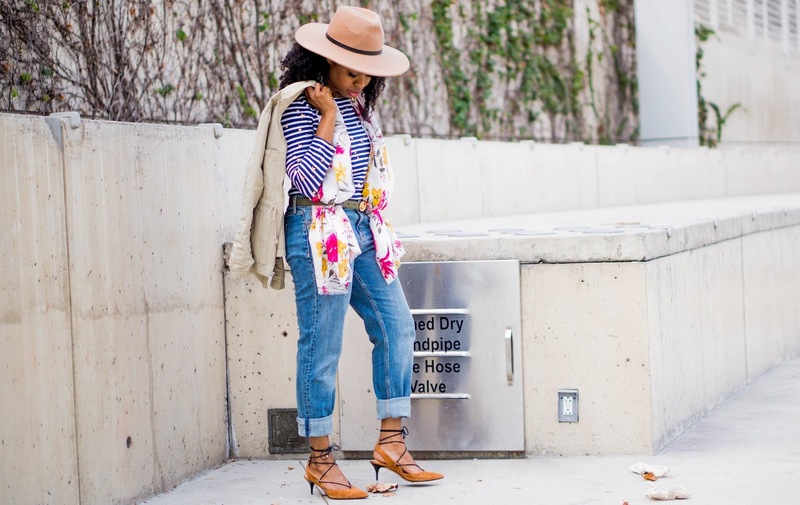 I love the stars and stripes combination on that top and all the print mixing in this outfit! Girl this outfit is on fire!! I seriously love the mixing of patterns! I so love mixing prints & patterns! Love how you styled your outfit and you're so freakin' adorable! Pattern mixing and layers are the two best things I love about fall. 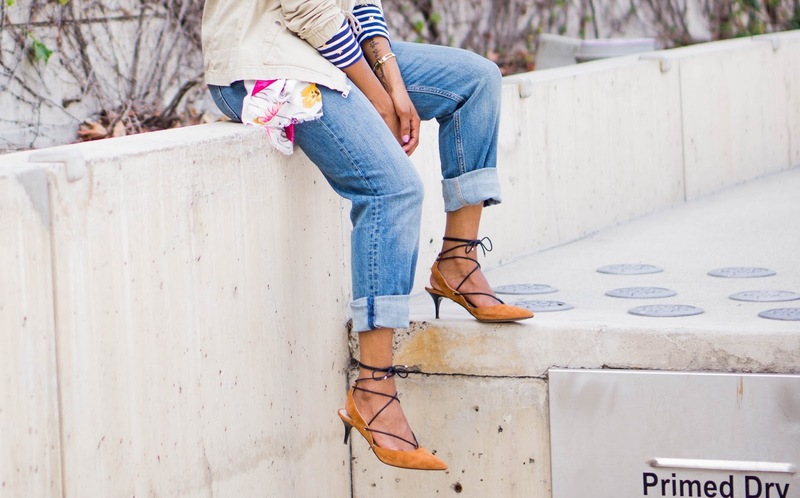 Love your lace-up sandals babe.